Ask fellow campers about "Hickison Petroglyphs BLM Campground" and nearby attractions. I agree that any rig much longer than 30' will have difficulty maneuvering in the campground section. Stop at the turn circle and walk the road through the campground before you commit to the narrow spaces between the overhanging trees and tight corners. My rig is 52' from front bumper of the PU to the rear bumper of the trailer. I made it in and out OK, but did take it slow and had to take the turns as wide as possible. Even so, the sides of the trailer did contact the small overhanging branches of the pine trees. No damage to trailer or trees, but I did stop to assess individual corners before committing to going through. 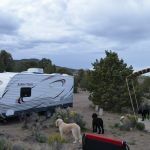 We camped at Hickison Petroglyphs BLM Campground in a Fifth Wheel. Free overnight stop over on one of the best highways in Nevada. I love route 50! Light traffic and decent scenery if you're aware of the geology of the basin and ranges. Worth a Google to understand how this unique terrain came to be. Wanted to see the petroglyphs. They're disappointing in that more "modern" individuals have scratched over some of them. Additionally, the originals are not well preserved and are mostly indistinct. Still, it's cool that someone hundreds or thousands of years ago took the time to peck out carvings in the rocks. Also wanted to be away from city lights to be able to see the Milky Way. That did not work out as there were heavy clouds and a few sprinkles of rain overnight. Free site, clean pit toilets but no water, no dump station nearby. Great views of the Diamond Valley and Range. We camped in a 27' trailer, some turns are a bit tight but no problem for us. Wooded sites are more private but less level than the open pull thrus. The pull thru sites include a small shade shelter. We camped at Hickison Petroglyphs BLM Campground in a Travel Trailer. Fun place to stay a day or two, great location for horses or mountain bikers. Spencer's hot springs are nearby, also a bare bones boondocking area. There are flush toilets and running water at the NFS campground about 5 miles east of here towards Austin, NV. This is a BLM campground so there are no amenities. But, it's free. You cannot get a big rig in here. We measure 24' and anything much longer will be in trouble. That said, it's a very nice place with a very cool nature trail that takes you to see petroglyphs and also a great view of the surrounding landscape. It is dry, with low, scrubby trees, picnic tables with a constructed roof overhead, and dirt parking spots. Leveling is a bit of a problem. This place is very BASIC. Not for those who want comforts. We camped at Hickison Petroglyphs BLM Campground in a Motorhome. Take the petroglyphs nature hike from the campground. Short and very good. Nice spot on the loneliest highway in the world. Quiet , beautiful , clean. If you like dry camping & are under 30ft. You may like it too. Views & walks are wonderful, Verizon cell too! But have it all on board no water no nothing! We camped at Hickison Petroglyphs BLM Campground in a Motorhome. This is a beautiful little BLM campground just off Route 50 west of Austin, NV. Its a perfect overnight stop over for small rigs. I doubt big rigs would fit. Each site comes with a picnic table and most seemed to require some leveling. The view is awesome, though, and the best part is that there is an interpretive trail you can take that passes wonderful sandstone formations with lots of petroglyphs on them. I didn't see a self-pay kiosk so my assumption is that this is a free site. Next time through I would consider staying for more than just one night. We camped at Hickison Petroglyphs BLM Campground in a Truck Camper. Free overnight stop over on one of the best highways in Nevada. I love route 50! Light traffic and decent scenery if you're aware of the geology of the basin and ranges. Worth a Google to understand how this unique terrain came to be. Wanted to see the petroglyphs. They're disappointing in that more "modern" individuals have scratched over some of them. Additionally, the originals are not well preserved and are mostly indistinct. Still, it's cool that someone hundreds or thousands of years ago took the time to peck out carvings in the rocks. Also wanted to be away from city lights to be able to see the Milky Way. That did not work out as there were heavy clouds and a few sprinkles of rain overnight. Fun place to stay a day or two, great location for horses or mountain bikers. Spencer's hot springs are nearby, also a bare bones boondocking area. There are flush toilets and running water at the NFS campground about 5 miles east of here towards Austin, NV. Are you affiliated with Hickison Petroglyphs BLM Campground ?